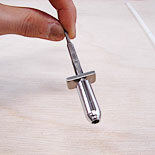 A truss rod is embedded in the neck and only a part of it is visible near the nut. Its role is supportive and it is only used when the neck warps. However, I think this part is worthy of note. The kind of material I use is an alloy called beta-titanium. Titanium has the advantage of being light, strong and resistant to corrosion, and it is used in various fields of industry. On the other hand, beta-titanium is much stronger and springy than regular titanium, and it produces a clear sound when tapped with something hard. I do not think it directly affects the overall sound of the guitar, but I am very pleased with its characteristic lightness whose weight is 1/4 lighter or less than that of regular material used for a truss rod. The lightness of beta-titanium has a great effect on the overall balance in weight distribution of the guitar, and I think that very interesting results will be gained depending on how the neck is adjusted and tuned up. The important thing to note is that you might need to consider the possibility of making some structural changes on the guitar you are building according to the light weight of a beta-titanium truss rod. However, it is better to think carefully and work out a conclusion without hurry than forming a hasty judgment only based on the less weight of a beta-titanium truss rod. I will continue to examine this particular point from various angles. It was years ago when I first came across this distinctive wood material called padauk among bits and pieces of woods I bought at a timber dealer that I know. And then it was the reddish color that prompted me to create the design of the Carrera series. However, this wood requires due care because the color tends to rub off on the combination woods. So, naturally you need to treat them in a way that prevents them from being discolored by padauk. 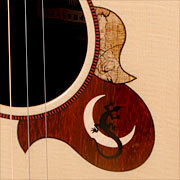 The inlay on the pick guard of Carrera looks simple enough, but much time and effort has been put into it. There is another interesting material called blood wood, which I have not been familiar with up until now. Its brighter reddish color might be more suitable for Carrera.